Well, Halloween is over and Thanksgiving is fast approaching. That means it is time to start planning for family, craziness, and the much anticipated dinner. 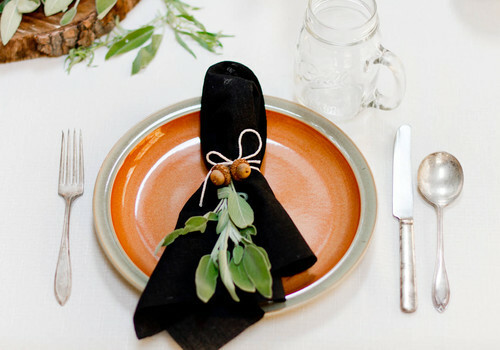 What better way to prepare than to plan for a beautiful place setting. 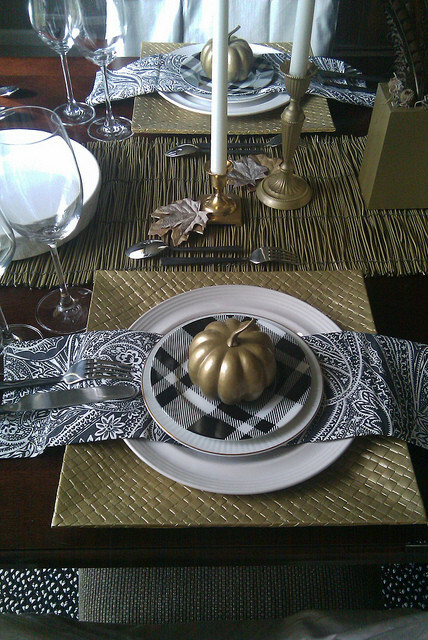 Today, I have 7 fabulous Thanksgiving place settings, plus some free printables to help get you through the holidays! It need not be expensive, or even elaborate, to be elegant. If you continue on through the article, I will tell you how to get these lovely place cards, which you can label as needed. This helps solve the issue of where everyone will sit. In addition, I have created matching leftover tags and a nice frameable image. The leftover tags can be printed on sticky paper for easy peel-and-stick labels, or on stock card paper to be used as tags. The frameable image is designed as an 8X10, but feel free to size it as needed. 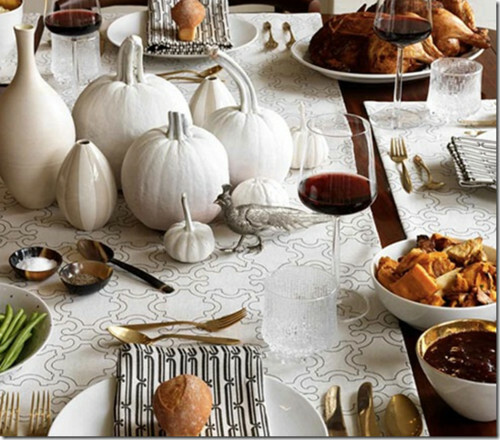 For the moment though, let’s take a look at some of these inspiration ideas for table settings. 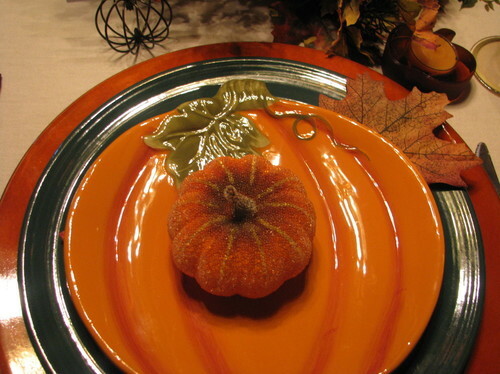 I love how these place settings have pulled the Halloween colors of orange and black into the Thanksgiving theme. It is simple yet elegant without being too busy. 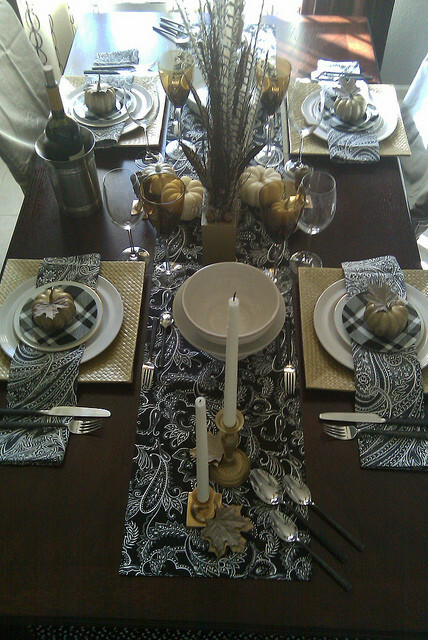 This table setting has also captured black as its central color. However, they have traded out the traditional orange for a wash of gold. Right now, pastel and chalk paints are all the rage. These tables have been done in white, and it looks quite cozy. If you love the shabby chic, farm house look, or even basic traditional, these table settings are probably appealing to you. I like the way that this homeowner has continued this room’s monochromatic theme by using the white centerpiece. 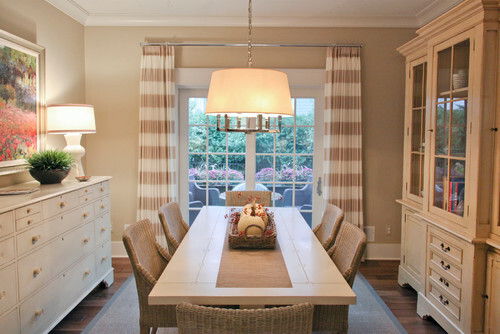 But, the white centerpieces work just as well with richer pieces, as shown here in this traditional styled home. Who says that Thanksgiving is an inside event? If you live in an area where the weather is nice, why not just move everything outdoors. 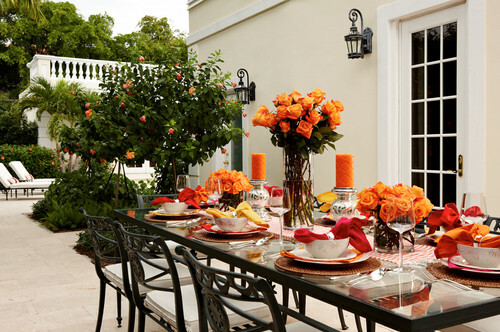 If you opt for an outdoor event, remember that the bright traditional orange can lend some much need color for this time of year. As can be seen in these photos, orange can be made as high end as any other color. Or, take a more rustic approach. This display can be achieved by collecting most of the items from nature. A vase full of chestnut, some gourds, and a few well placed leaves and you are just about there. 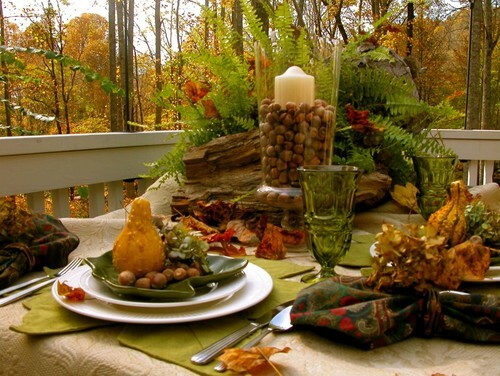 I like how this table mirrors the autumn landscaping. So, I have created a few printables to make your holidays easier. Here, I have changed out my Halloween printable for this Thanksgiving one. It is a chalk leaf on a burlap background. It is really difficult to get this image to photograph as nice as it looks in person, but I am trying. 🙂 Here is a bit better view. (Update: This printable has been moved to my Free Printable Section, which is available to all subscribers. You can gain access to this and many other printables just by signing up for our email newsletter). These printables can give your leftovers that final touch. Just print, peel, and stick. I like using place cards when I have large numbers of people over, and the holidays are a perfect example. Place people where you want them -either near you, or far, far away- 😉 (Update: These printables have been added to my Free Printable Section, which is available to all subscribers. You can get this and many other printables for free, just by signing up for our email newsletter). I hope that you all have a great Thanksgiving, and I hope that you enjoy these free printables. But be sure to get them now, because come December they will be gone. This post was shared with Savvy Southern Style, The Happy Housie, Blesser House, Remodelaholic, and Just a Girl and Her Blog.